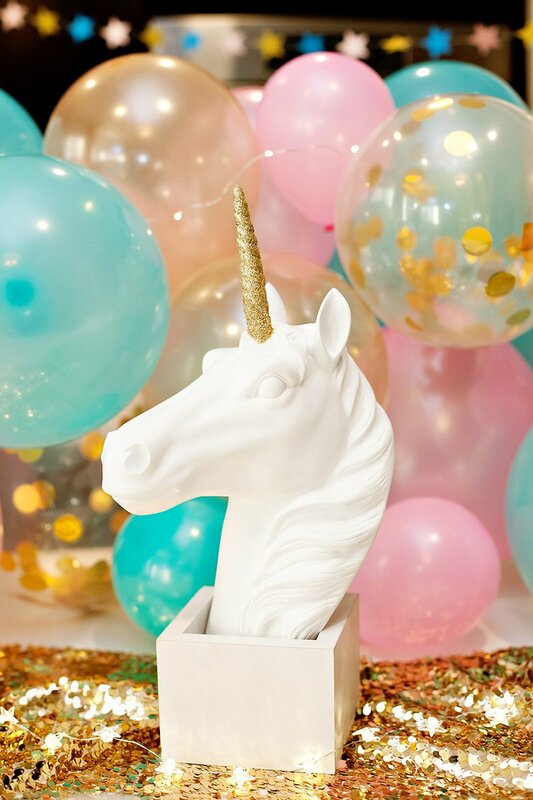 Tonya Coleman here from Soireé Event Design, and I’m back with the “Trend Alert” where I share with you some of the hottest trends in party planning! Today’s guest post is all about the hot new trend of decorating with BRIGHT COLORS FOR CHRISTMAS PARTIES! There are so many color options now available in Christmas decor besides the traditional red and green color palette. 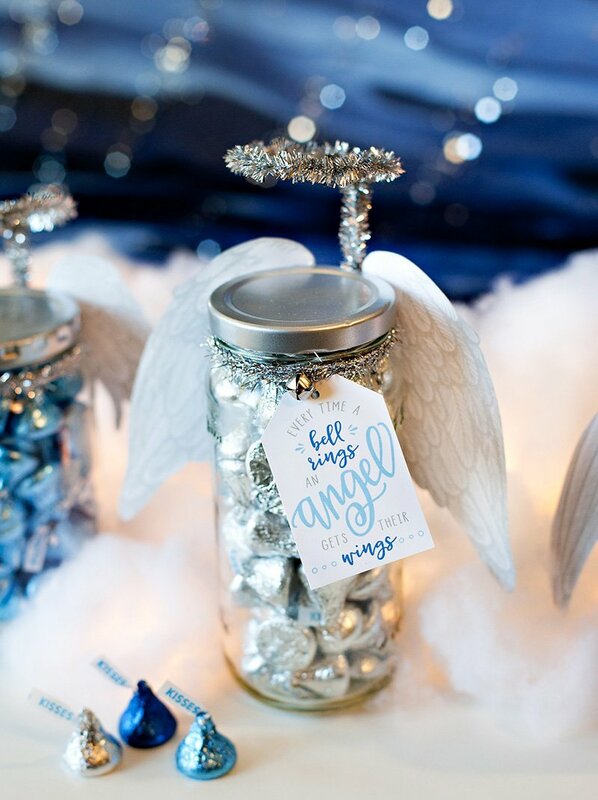 My favorites are the brightly colored Christmas decorations, which are perfect party decor for a cute, whimsical themed Christmas party like this Christmas Wonderland party I designed. I LOVE Christmas! It’s a time of giving, spreading joy and of wonderment and excitement for children. After living in California for many years, I decided to do a theme this year that is a tribute to the summery Christmas’ spent there. I can remember quite a few years where we put up the tree with shorts on! Now living in Minnesota, where it is very cold and snow-covered at Christmas time, I thought it would be fun to design a summertime Christmas Wonderland theme to contrast with the frozen tundra outside my window. Brightly Colored Outfits Set the Tone! 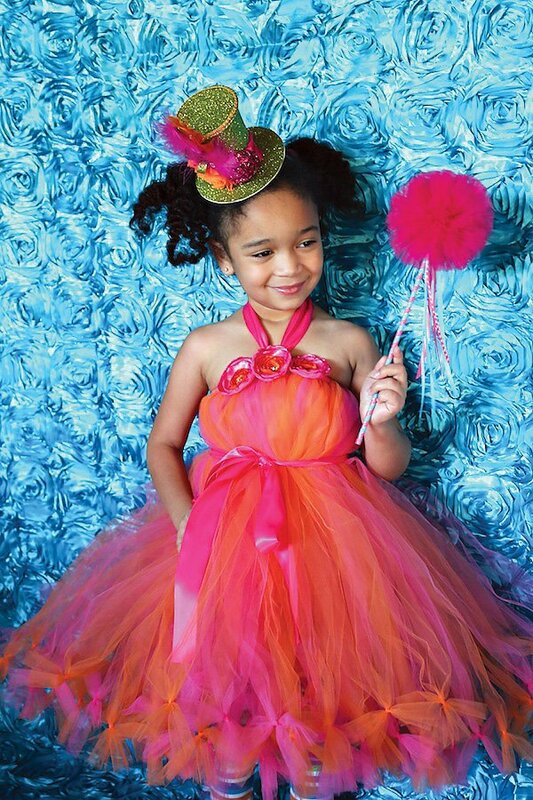 This gorgeous tutu dress from Atutudes, mini top hat from Cupcake Wishes and tulle pom wand from Titi’s Tutus was the perfect whimsical outfit for our guest of honor to wear to greet her friends and set the tone for this unique holiday theme. Each guest was also greeted with her own wand, tutu and top hat to wear during the party. The decor plan for this theme consisted of a bright glittery color palette mixed in with modern pops of white and metallic gold which is the hot new color this year! To achieve this look I started as I always do with designing the perfect printable collection to match the theme. This “Christmas Wonderland” collection (now available in my shop here) has a golden background like the sun mixed in with pops of bright, vibrant colored flowers and finished off with modern, white snowflakes. I loved the unexpected mix of bright flowers and modern white snowflakes and snowballs. 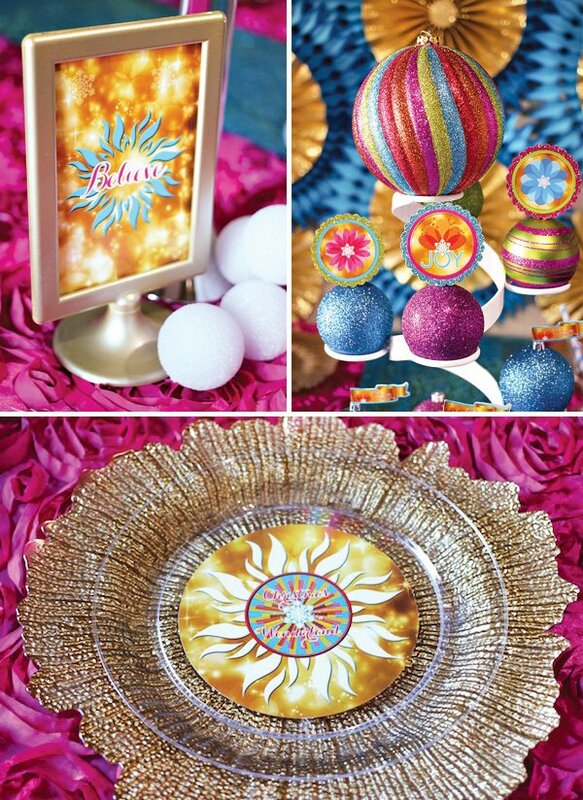 I wanted a wow-factor backdrop for behind the dining table that set the scene for a whimsical summery holiday and this showstopper pinwheel backdrop from Peckled of gold glitter and turquoise reminded me of many sunny days spent at the beach in California. The rosette tablecloth from Efavormart was the inspiration for this entire design. 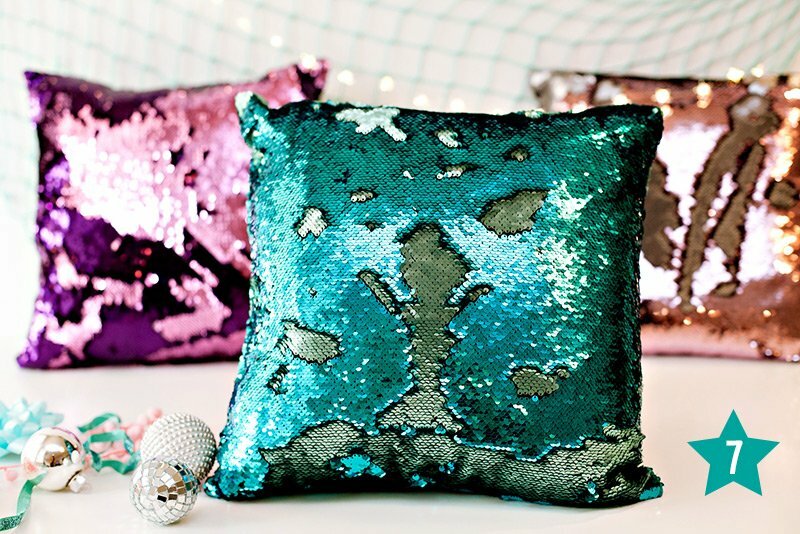 They come in many bright colors — the pink was perfect topped with a turquoise sequin runner from Koyal Wholesale that sparkled in the light just like the ocean! I created custom place settings by topping these golden glass flower-shaped chargers with custom printable plate inlays that I placed between two clear plastic dinner plates. I used printable circles as napkin rings and printable straw flags hanging from stemmed glasses. The straw flags could also be personalized with each guest’s name so they can keep up with their own drinks. 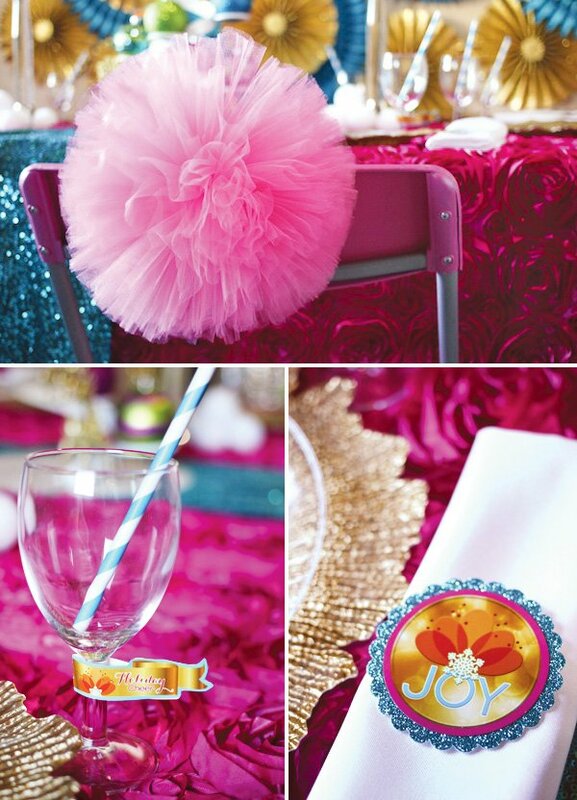 For a touch of whimsey, I added these fabulous vibrant colored tulle poms from Titi’s Tutu’s to the backs of each chair. To create a whimsical wonderland centerpiece I used this modern white spiral cupcake stand from Dress My Cupcake to create my version of a modern christmas tree centerpiece. 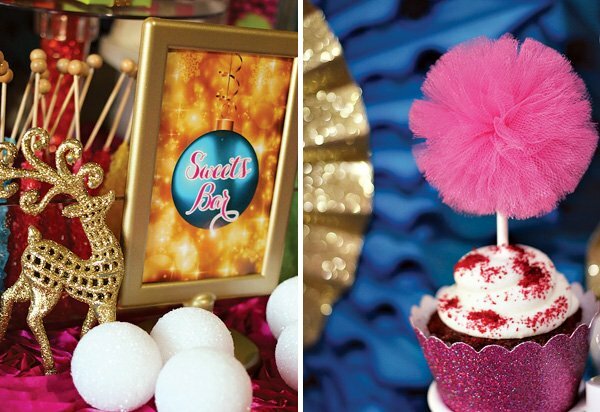 Instead of cupcakes, I used glittery ornaments where the cupcakes would normally sit and to further customize it, I simply placed printable circles and straw flags to the tops of the ornaments. 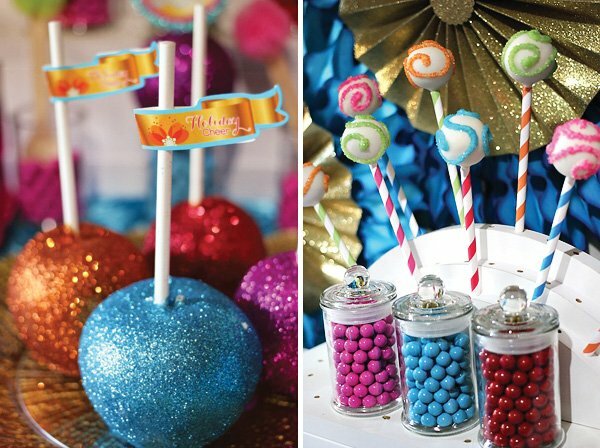 This bright theme wouldn’t be complete without bright, glittery desserts to match! Sparkly desserts like these glittered apples and cake pops from Autumn Lynn’s Chocolate Sins were perfect along with the swirl sugar cake pops from Sweet Cheeks Tasty Treats. 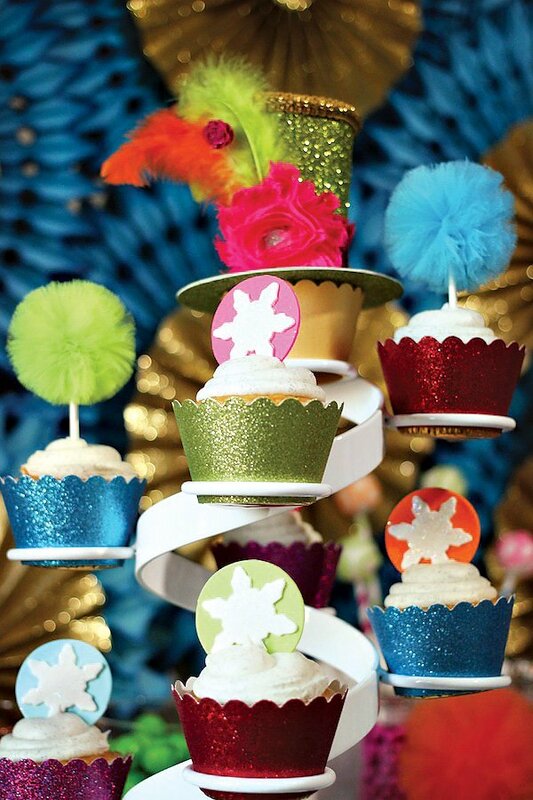 These spiral cupcake stands are a fun way to display cupcakes wrapped with colorful glitter cupcake wrappers and topped with a mix of tulle cupcake toppers and fondant snowflakes from Edible Details! 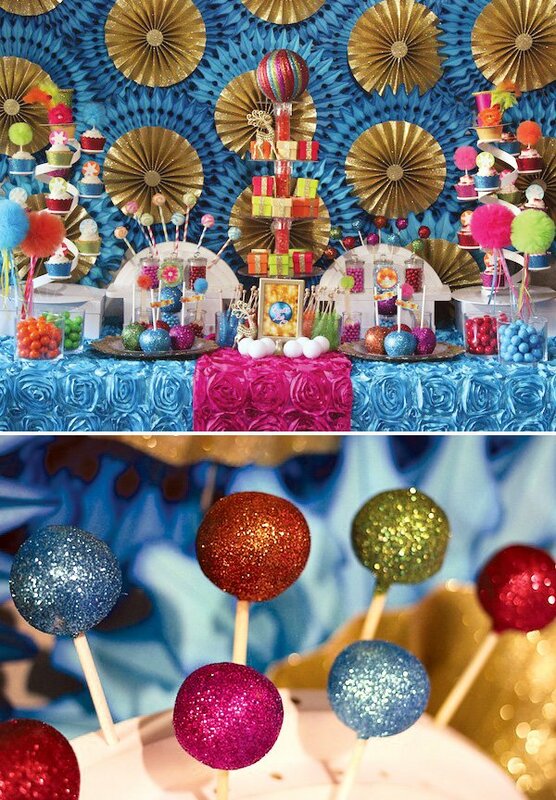 The centerpiece is a towering gift display of brightly colored favor boxes from Koyal Wholesale filled with the guest of honor’s favorite candy, simply wrapped with gold glitter ribbon to match our party colors. This fun and whimsical Christmas theme can truly be enjoyed by kids and adults alike this holiday season. Merry Christmas! 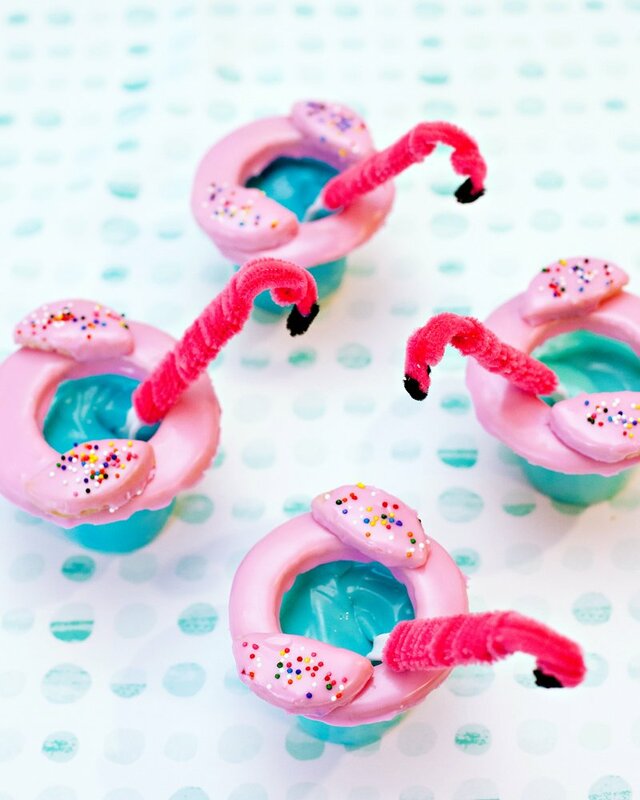 Want more party inspiration and tips? 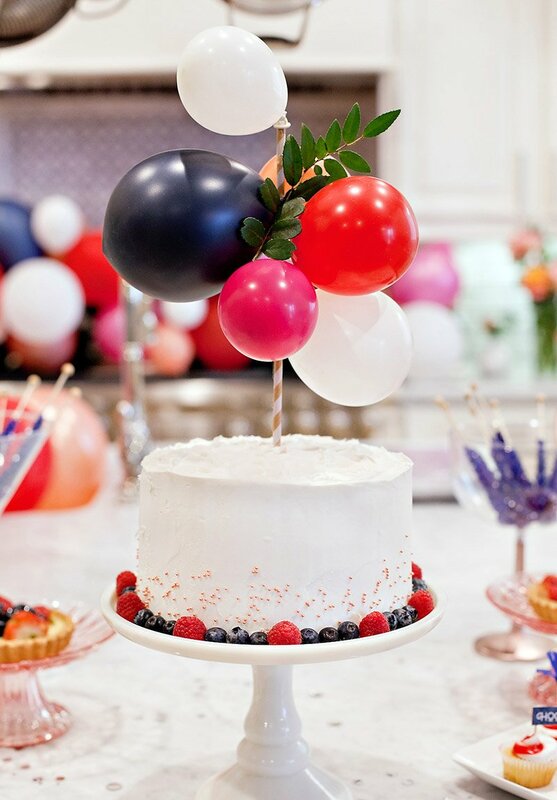 Head over to my blog and check out my Pinterest board for a list of most of the items I used in this party’s design along with prices and links to purchase them. Oh my goodness this is just so amazing! Being that I currently live in Florida I love the idea of a summery whimsical Christmas wonderland. 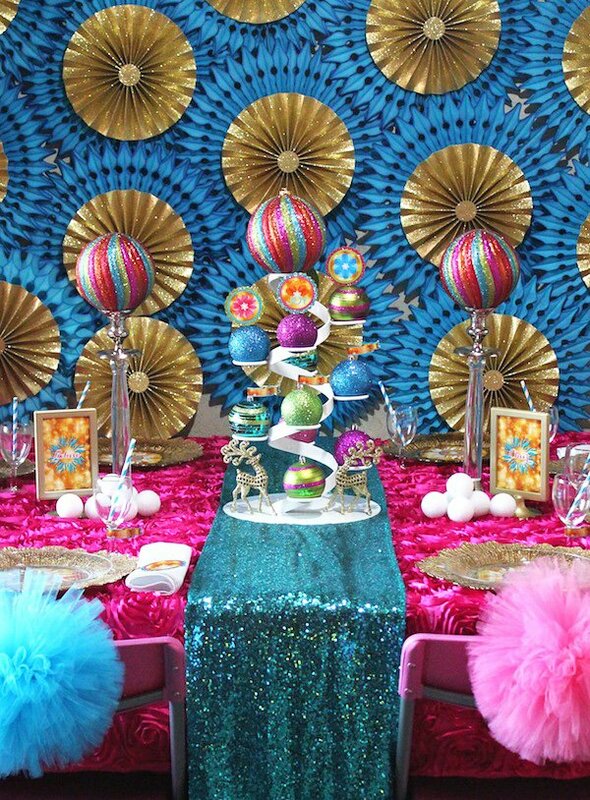 I love everything about this party the backdrop is phenomenal love the perfect way all the colors fit in so elegantly. The Sweets are to die for. Great Job just love this. 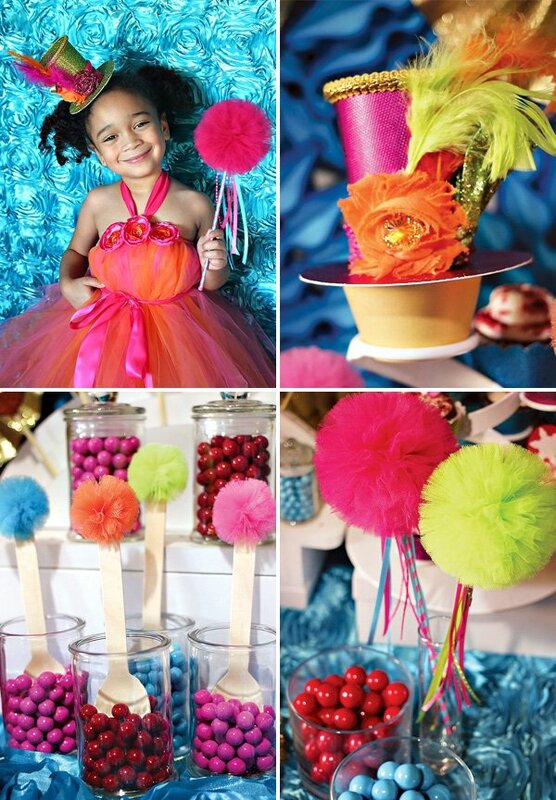 Your little fashionista is adorable love her outfit and the tulle poms great touch! pom pom’s were used. This party screams fun. Great job Tonya! Love the use of all these colours together! It absolutely comes together beautifully! How fun! 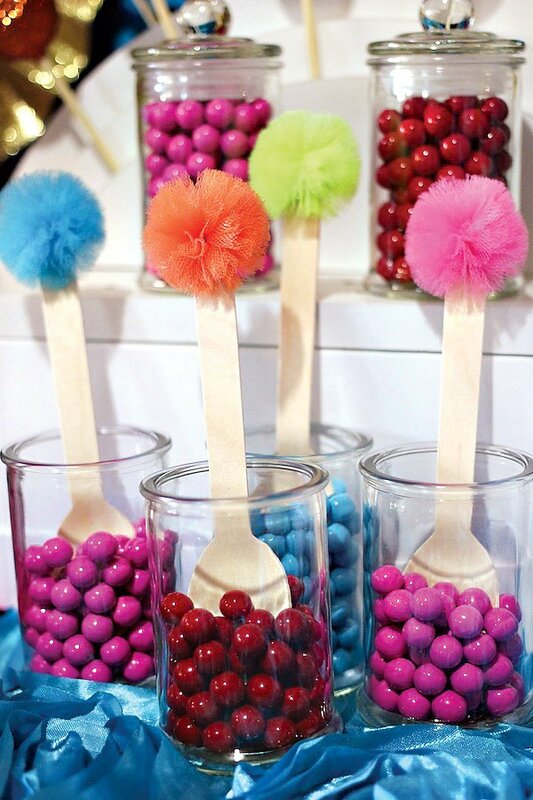 I love the pom wands! Super cute!